For Florian's birthday a couple of weekends ago, we decided to really live it up and go on an overnight trip. Let's go to Berkeley Springs, I thought, and we'll have a thoroughly romantic, relaxing hiking, soaking in the mineral baths, maybe getting a massage and staying at a nice B & B or a rental cabin. When we got to Berkeley Springs, we continued through the town and stopped at Cacapon Resort State Park. 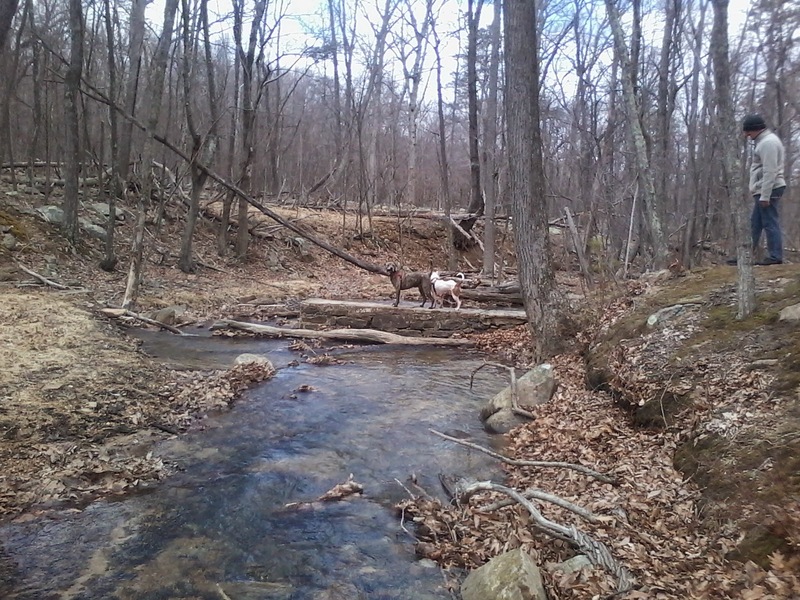 It was chilly, so no one was around and we could let the dogs run like wackos. Something about Berkeley Springs just makes me so happy, maybe because every time I've been there I've had a really good time. The first time was in 2009, when my sister rented a house near the Cacapon and my whole family stayed there. The hikes and scenery are amazing, and the town has all these groovy little shops full of Tibetan clothing and fragrant soaps and nifty hippie stuff that is right up our alley. With the dogs nice and tired, we felt pretty good leaving them in the car while we went to go check out the shops and buy some aromatherapy body spray. Then it was getting into evening, and we were thinking about finding a restaurant and a relaxing, pretty room with a jacuzzi in one of the many spas in town. But that would have required staying in one place for a while. Silly me! This was a weekend with Florian, and that was out of the question. Back in the car, off to another town closer to where we wanted to hike the next day, and to a Motel 6 next to a strip mall and a really good Thai restaurant. We love Motel 6. Always pet friendly, with no pet fee! And the rooms have wood floors, how cool is that? The next day, we were close to Williamsport which is right next to the Potomac. Breakfast in a nifty little independent cafe and then a hike along the C & O Canal. I love the C & O canal trail, with the water right next to it, but it was a bit tranquil for Florian. So off to our next hike, the Washington Monument State Park along the Appalachian Trail. It was fun to see the through-hikers, with their scruffy faces and enormous packs, and neat to see the little shelters they stay in for the months they are on the trail. A nice trail up to the monument, which was at the top of a hill. It's the first completed monument dedicated to George Washington, built by the citizens of Boonesboro in 1827.
and a good place to enjoy the sun and relax a minute. before descending inside the nifty stone tower. Another whirlwind trip with Florian and the pups! Maybe we'll get to that hot tub for his 80th birthday. We love winter hikes with few leaves and few people. Haha, sounds like us Kirsten! Can't stop moving. Don't totally regret it though :p Also, how handsome has Fozzie gotten? Make it a requirement for your birthday. :-) He chose Motel 6 for his birthday, you choose the Jacuzzi for yours. It does sound like a great time though!